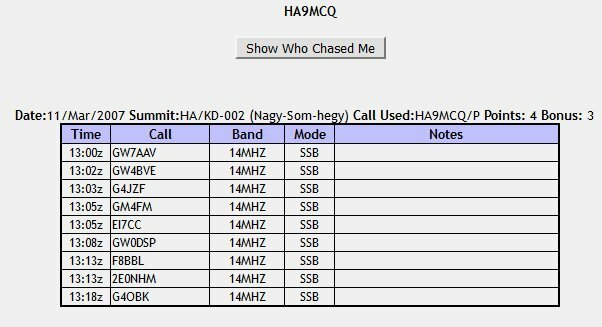 Few days ago, Laurent, F8BBL, sent me his full log in order to upload his chaser QSOs. Many errors have been detected when analysing his log with SAISIE_SOTA. Most of them were corrected but I don’t find what is going wrong for some others. When uploading a part of his csv file, the system did’nt accept many QSOs. the QSO date takes place between the ‘Valid from’ and the ‘valid to’ dates of the summit. the QSO is in HA9MCQ/P’s log. Lines in red have errors… none visible. Lines in black are fine and can be submitted. What is the error message displayed? In this file, ON/ON-009 is valid from 01/01/2009 to 30/09/2011. There is a bug with the database. The scoring code can cope with a summit having multiple values. But it cannot (yet) cope with summit being valid for 2 periods with a gap inbetween. I do not have a fix for this yet. So keep hold of your logs for uploading when I do fix it. This applies to some summits in ON, OE and DM I think only. Yes Andy, I understand that it’s not easy to implement many valid periods, and more, multiple values in the database. I suppose that one solution is to use new ref to summits when their data are changing, and keep the old ref in the database. I think of Baystones G/LD-039 as the canonical example, though it probably helps that the first period of validity was very short and that it is not valid now. I noticed that the link to get summit.csv is not valid. By the way the “Summits Update” in Saisie_Sota does not work (fail to update). I’ve clicked the magic link and the process ran fine this time. This is a known issue with the DB but I did put some code in place to mitigate it happening. It used to happen really often and now happens once every few months since I made the changes. The summit closed here for some reason, this may be the reason. The reason for the closure’ll write later.